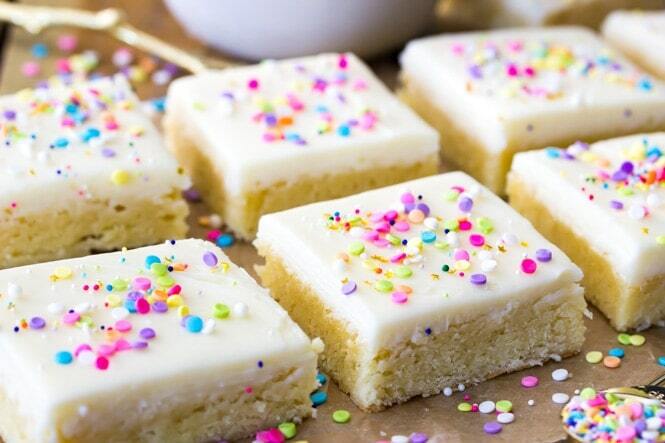 Buttery-soft sugar cookie bars topped off with a sweet buttercream frosting and plenty of colorful sprinkles! These cookie bars make a great treat any time of the year, but they’re easily customizable with festive sprinkles for the holidays or special occasions! 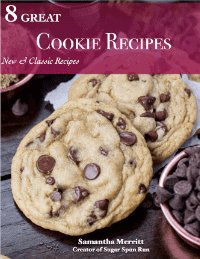 One more cookie recipe for you before Christmas! Ok, these don’t quite look like traditional cookies, but these sugar cookie bars are just as good, and if you’ve been putting off your holiday cookie baking you’ll be relieved to hear that these are a total breeze to make. 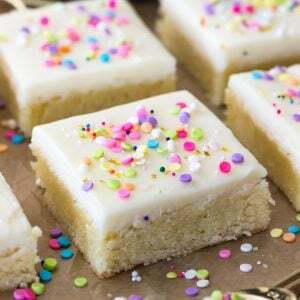 There’s no chilling, cutting, or rolling required (I’m looking at you, classic sugar cookies), no scooping or waiting for your cookie sheets to cool to drop another batch into the oven, just spread your sugar cookie bar dough into the pan, bake it, and top with this sweet, simple 4 ingredient frosting. And with sprinkles, of course. If you’re still in holiday baking mode, these sugar cookie bars can totally be decorated with festive red and green sprinkles for Christmas or colorful confetti sprinkles for New Years. 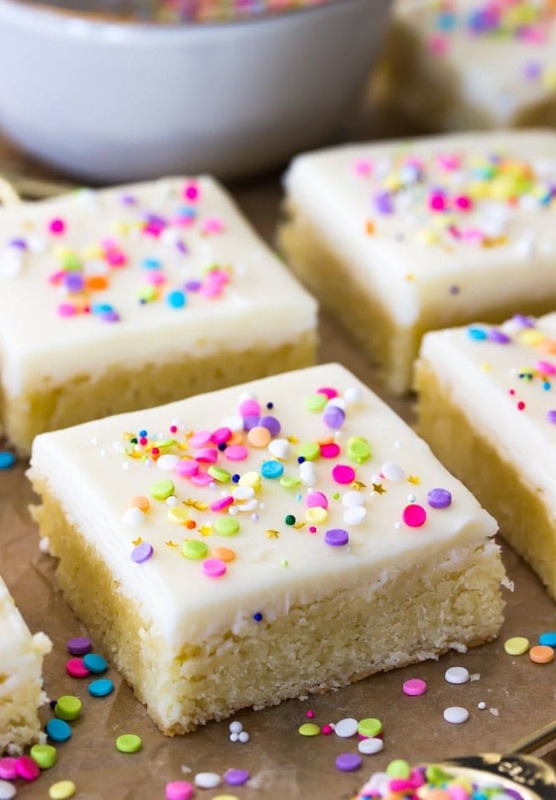 With their thick, chewy bases and their sweet buttercream frosting, these sugar cookie bars all but melt in your mouth. To make the bases so soft, I add a small amount (2 oz) of cream cheese into the dough. This not only makes the cookie bar base extremely soft, but it also gives it a great flavor and helps keep them from being too sweet. Make sure to allow your cream cheese (and butter) soften to room temperature so that they’ll completely cream together when you go to combine them. This sugar cookie bar dough will be thinner than your average cookie dough, but it’s still pretty thick and sticky and can be hard to spread into a parchment-lined baking pan. You can just grease and flour your pan, but I really love to use the parchment as it makes it so easy for me to just lift the sugar cookie bars out of the pan once they’re done cooling and I can easily decorate and slice them (plus pan cleanup is super easy that way, too!). For me, it’s worth the trouble of wrestling the dough over the parchment paper. 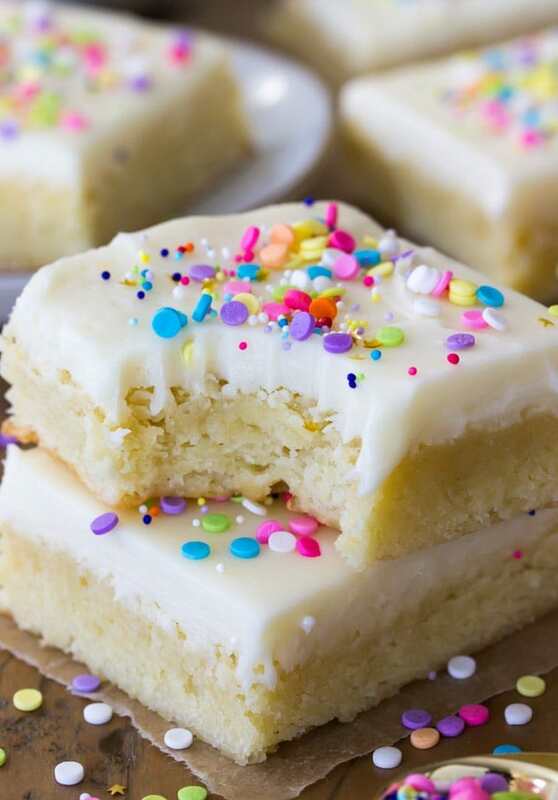 I topped these sugar cookie bars off with a very simple buttercream frosting. The frosting is just four ingredients — butter, sugar, vanilla, and a pinch of salt for added flavor. I typically tend to find buttercream to be almost too sweet for me, so I keep the frosting layer pretty thin. Even then I liked to cut these sugar cookie bars into even smaller pieces than you see in the pictures, as they’re still fairly sweet. Alright, well I have a ton of gift wrapping to do and not a whole lot of confidence that I can finish it in 3 days… so wish me luck, and I hope that you love these sugar cookie bars! 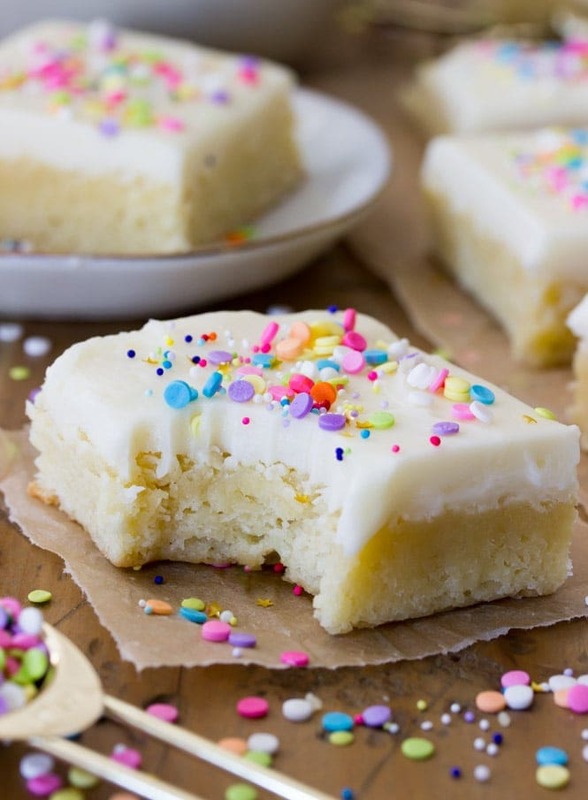 Soft and chewy Sugar Cookie Bars with a sweet buttercream frosting and plenty of sprinkles! Preheat oven to 350F (175C) and prepare a 13x9 pan by lining with parchment paper (or lightly grease and flour the pan). Set aside. Combine butter and cream cheese in the bowl of a stand mixer (or use a large bowl and an electric mixer). Beat together on medium-speed until well creamed (about 1 minute). Add sugar and gradually increase mixer speed to high, beating until well-combined and fluffy (about 1 minute). Add eggs and egg yolk, one at a time, stirring well between each addition. Scrape down the sides and bottom of the bowl as needed to ensure ingredients are well-combined. Gradually add dry ingredients to wet, stirring on medium-low speed until completely combined. Spread batter evenly into prepared pan and bake on 350F (175C) for 25-30 minutes or until center is set and edges are beginning to turn light golden brown.. Allow cookie bars to cool completely in pan before covering with frosting. Place butter in a large bowl and beat with an electric mixer until cream. Gradually add sugar until completely combined. Stir in vanilla extract and salt, stir until well-combined. Spread over completely cooled sugar cookie bars. 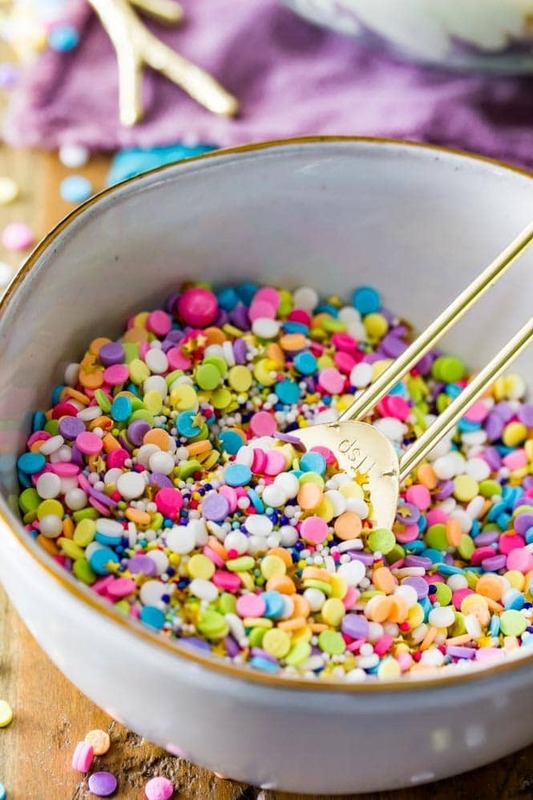 Decorate with sprinkles, cut into squares and serve. Next Post Crumbs & Merry Christmas! Thanks for this. I love all your recipes. I would love if you would develop a pistachio cookie bar recipe in the future! I am having the hardest time getting these to nicely spread in the pan with or without parchment. Is there some kind of trick to this? Thanks! It all worked out and they smell delicious. You weren’t kidding about the wrestling -patience is definitely key. Thanks for the quick response! Super yummy and these stayed soft for days! Thanks for a great recipe- I just pulled my second batch out of the oven!